In ABA programs, skills are broken down into their simplest components and taught in a step-by-step progression. ABA can be used to teach new skills, to decrease challenging and inappropriate behaviours and these outcomes can improve the quality of life of all those involved. Integrate Health Services offers a unique approach to ABA therapy, which allows us to address many areas of development for children and adolescents. For each client, individualized programs are created to facilitate the acquisition of skills required to be successful in all aspects of daily living, including the home and school environment, as well as within the community. These programs assist the individual in reaching their full potential by decreasing maladaptive behaviours and increasing the skills necessary to succeed. Our programs involve a family oriented approach that applies the principles of ABA in a structured setting, where the therapist works one-on-one or in small group settings with the child/youth. Programs are implemented based on areas of need identified by assessments and parent goals. 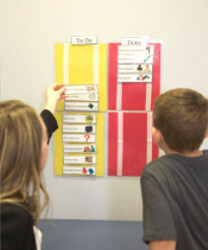 Examples of programs that may be implemented include targets related to self-help, school readiness, communication, social or interpersonal skills, self-regulation, motor development, vocational, personal responsibility/adaptability, cognitive function, and reducing challenging behaviours. WHAT TYPES OF ABA PROGRAMS ARE AVAILABLE? ABA therapy sessions are available Monday to Friday from 8:30am to 6:00pm and include individualized one-on-one or small group support based on the client’s identified goals. We provide comprehensive ABA services (15+ hours per week), focused ABA services (less than 15 hours per week), and consultative therapy/parent training service. We work with a wide variety of clients and families to create unique and individualized programs for each and every client. We also have an After-School ABA Program for children/youth that have integrated into the school environment already. We offer centre-based, home-based and community-based ABA services. We have two on-site Board Certified Behaviour Analysts (BCBA) who oversee all ABA students and programs. We will work with families who are currently on the wait list to access services as well as families who choose the Direct Funding Option (DFO). Families can also choose to pay privately for services. Specific areas of development are addressed based on skill deficits and client or parental goals. Behavioural Consultation services work with families to determine individual goals and to implement evidence-based strategies to aid with a variety of behavioural challenges. These challenges may include, but are not limited to: difficulties with noncompliance, aggression, property destruction, school avoidance, and transitions. ABA, whether be delivered in its intense form (IBI) or to a lesser degree, will use evidence-based techniques to target specific skills and behaviours dependent on the individual’s needs and goals. The custom-designed interventions result in skill development that will positively impact an individual’s behaviours and enhance personal well-being.